After my post about Luanda, the capital of Angola, an anonymous commenter asked me about a "less politically loaded" flag for the country. The flag is strongly inspired by the flag of MPLA, the ruling party of Angola since its independence. Red used to stand for socialism, but, in current representation, represents courage and the blood shed; black stands for Africa. The central elements, inspired by the Soviet flag, represent the workers of the country. The red color has the same symbolism of current flag. Blue stands for freedom, justice and solidarity; white, for peace, unity and harmony. 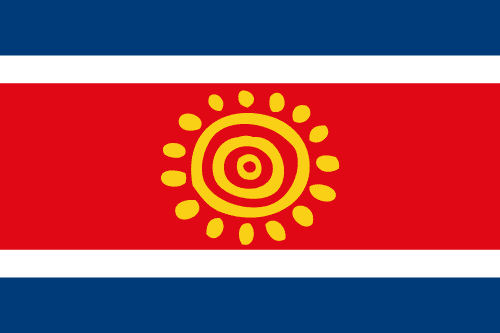 The central element is a sun drawn in native art style. I think the sun element is too logo-ish to stand in the national flag. The white fimbriations are purposedly big, representing the intended peace and harmony between the people and the parties after the end of the civil war. 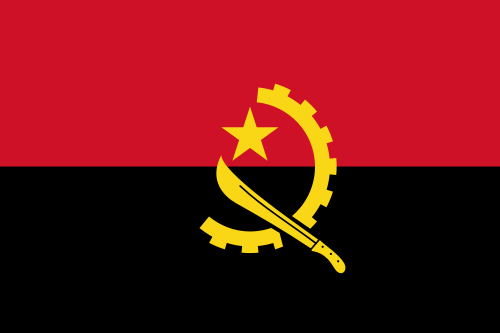 The blue, from the proposed flag, represent principles (freedom, justice, solidarity) that should be seeked; the red is present in the flag of Angola's three main parties (MPLA, UNITA and FNLA), and stands for the courage, heroism and blood; black stands for the African and Angolan people, and is an additional link for Pan-African colors. 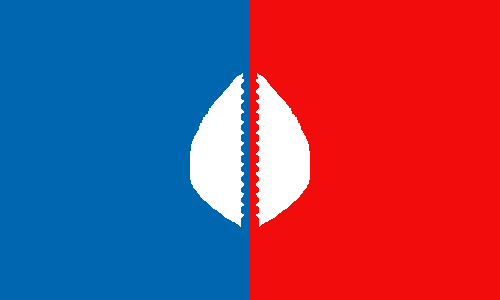 My proposal presents only a tiny similarity to current national flag, and I hope it's acceptable both by likers and dislikers of current one. Its boldness and strong symbolism is, of course, something essential to a successful national flag. The surprise I prepared to this week had to be postoponed to reasons out of my control. I'm sorry. Luanda is the capital of Angola. Brazil and Angola, being two parts of Lusophony with shared history, developed a close friendship. Luanda, for example, is friend city of my hometown, São Paulo. 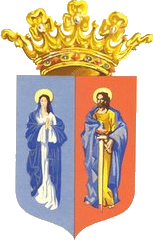 This flag showed Our Lady of the Assumption in a blue field, and St. Paul in a red field. Those were the patron saints of Luanda, and its full name was "St. Paul of Assumption of Luanda". The symbol in the middle of the flag is a stylized cowry, formerly used as currency in many parts of Africa and the world. It represents the shell money extracted in the island of Luanda, but also the wealth of the city and its African roots; it's also related to one of probable origins of city's name. I have exciting news for next week. Wait! On the first day of 2013, I officially started series of post about the state capitals of Brazil. That day, I commented, in details, the problems I saw on all those flags. If you haven't read it, click here. As none of the cities changed its flag, the image is still updated. Some of the flags I proposed were mere fixes, others were completely original. But, more than one year and a half later, I notice I learned a lot about flags design (vexillography) and the final result, in the end, were bold and clever flags. It's a good time to thank all readers for taking part of these (in my opinion) successful series. In your opinion, dear reader, what was the best post of these series? I'm really interested in reading you. Thank you very much, again. Your views, comments and sharing is fundamental to the blog! A very special post: the last of my series about Brazilian state capitals flags. Today, we'll look at Campo Grande, the capital of Mato Grosso do Sul. 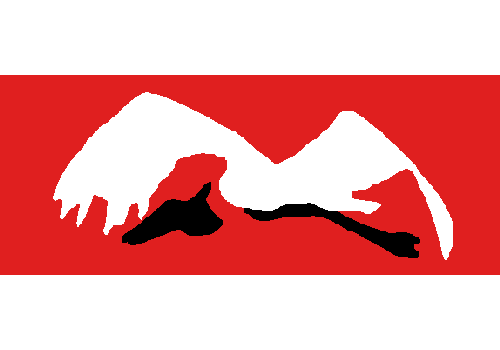 The eagle of the coat of arms holds a winding horn, symbol of the local agricuulture. 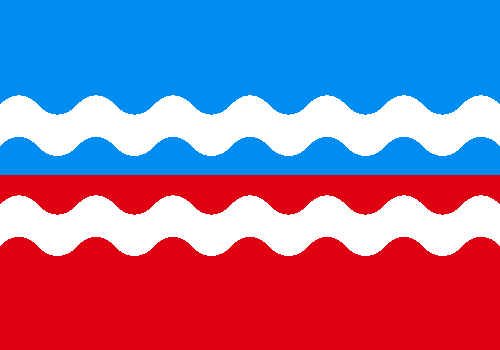 The two wavy stripes represent the Segredo and Prosa streams, and the silver bordure with red crosses represents the bandeirantes that settled in the region. It's not a bad flag, but it represents more the region than the city itself. 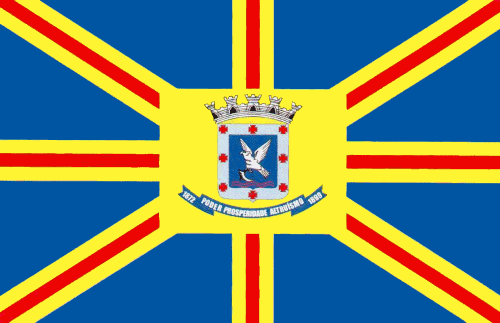 A curious fact about finishing these series with Campo Grande is that, actually, it was one of the earliest capitals for which I designed a flag prototype, that you can see below. It was inspired by the statues of jabiru, the majestic bird of Pantanal, present in local airport. From the coat of arms, the two streams that represent the foundation of the city. The bottom red stripe represents the red or purple soil of the place, that gives it the "olive-skinned city" nickname, and the links it still keeps with native people. The top blue stripe represents the horizon, very clear as the city is located in the top of a plateau. This flag is very unexpected, in my opinion, but I like it. And here is the last flag from my state capital series. Soon, the epilogue of the series. Wait!